Media captionParliament's Elizabeth Tower landmark and the famous clock are showing signs of wear and tear. Britain's most famous clock tower is to fall silent so that urgent repair work can be carried out at a cost of £29m. Parliament says it has no choice but to stop the chimes of Big Ben, after 157 years of nearly unbroken service, to prevent its mechanism from failing. The Elizabeth Tower, which houses it, will also be repaired during the three year project, which starts next year. The clock will not be stopped for the entire three year period, a spokesman told BBC News. "The clock mechanism will need to be stopped for several months in order to carry out essential maintenance," said the spokesman. "During this period there will be no chimes. We are also investigating whether or not the chiming will have an effect on operatives working at high level, which will need to be taken into consideration. Striking and tolling will be maintained for important events." The Big Ben nickname originally referred to the 13.5 tonne Great Bell within the tower, but has long been the commonly used name for the clock and tower as a whole. The refit could see the clock faces stripped of the black and gold paint that was applied in the 1980s to return them to their Victorian appearance, which is thought to feature green and gold paint. Parliament says in an extensive Q&A on its website that parts of the Great Clock have become worn and require urgent investigation and repair, and there is a high risk that the clock would fail if the problems are not addressed soon. There are concerns about the pendulum's accuracy, and the suspension spring, which holds the pendulum in place, needs to be replaced. Steve Jaggs, Keeper of the Clock, said: "This project will enable us to give one of Britain's most famous landmarks the TLC it so desperately needs and deserves." Standing next to Big Ben as it strikes 10 o'clock is a staggering experience. Despite the earplugs provided, your can feel the vibrations running through your body long after the bongs have died away. It's been 157 years since the famous clock - a symbol of London, standing 96m above the Houses of Parliament - began service and it needs work to preserve it. "It's been running 24/7," says Paul Roberson, one of the clockmakers at the Palace of Westminster. "You wouldn't run a motor 24/7 for 150 years without maintaining it. The Elizabeth Tower, which is visited by 12,000 people a year, is structurally sound but work is needed to fix cracks in its water-damaged masonry, cast-iron roof and belfry and the frame which holds the bells. 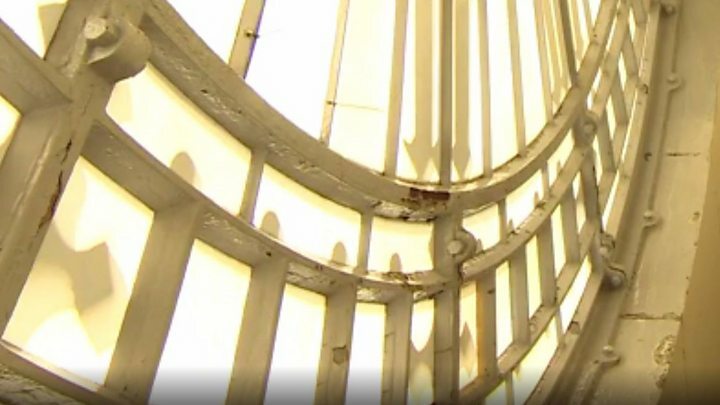 The Ayrton Light, which tops the tower and shines to indicate that Parliament is sitting, also needs to be fully dismantled and restored. Work will also take place to bring the building up to modern health and safety standards. A lift will be installed in one of the ventilation shafts to reduce the time it takes to evacuate an injured person and improve access for disabled people who are unable to use the 334 stone steps. A basic washroom will also be installed - there are currently no toilet facilities or running water in the tower - and the lights illuminating the clock dials and the belfry will be replaced with low energy LEDs. The clock and clock tower were last refurbished just over 30 years ago. Lib Dem MP Tom Brake, spokesman for the House of Commons Commission, described the Elizabeth Tower, which is a UNESCO World Heritage Site, as "a symbol of the UK's democratic heritage". He added: "We have a duty to ensure that it is safeguarded for future generations to appreciate, just as we owe it to our predecessors to restore their masterpiece to its former glory. "While these works are much needed in the short-term, they will also ensure the long-term future and sustainability of Big Ben."